I can't believe Christmas is almost here! We have been wrapping up last minute shopping and now it is officially time to relax and enjoy time with family and friends. I am looking forward to curling up next to my dad's fireplace with a nice cup of coffee in hand on Christmas morning. There is nothing that beats being home for the holidays. 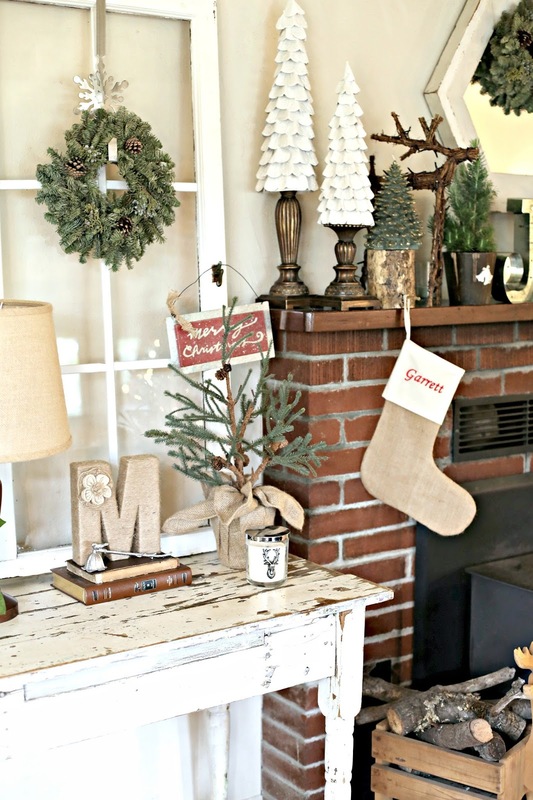 For today's post, I wanted to walk you through our holiday home. I've been adding to my Christmas collection by adding two to three new pieces per year. 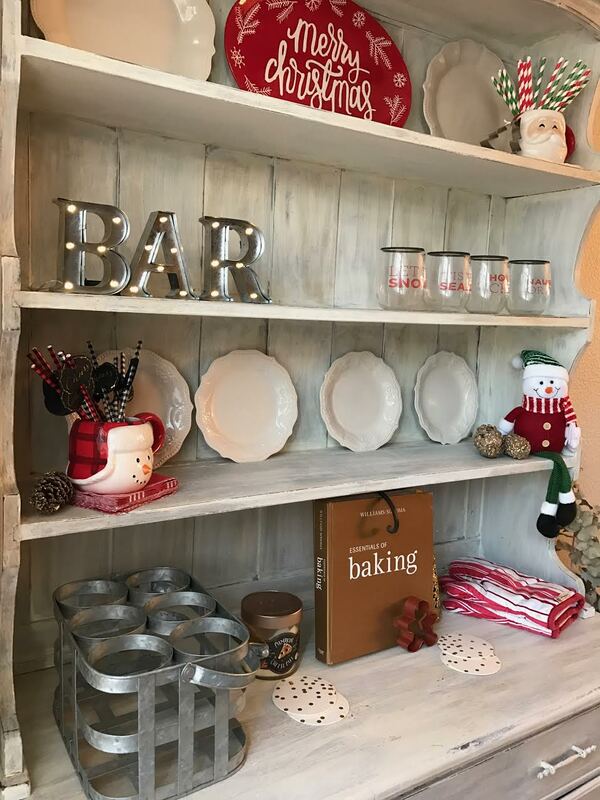 I was thinking of splurging this winter and shopping some killer sales at Pottery Barn and World Market after Christmas. 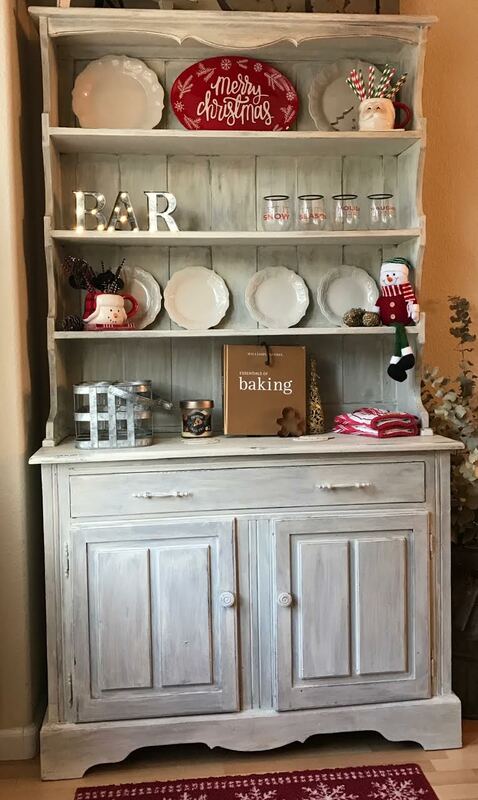 I fell in love with this hutch as soon as I saw it, and it's beginning to be one of my favorite pieces in our home. I'm obsessed with the fact that you can change it up for EVERY season. 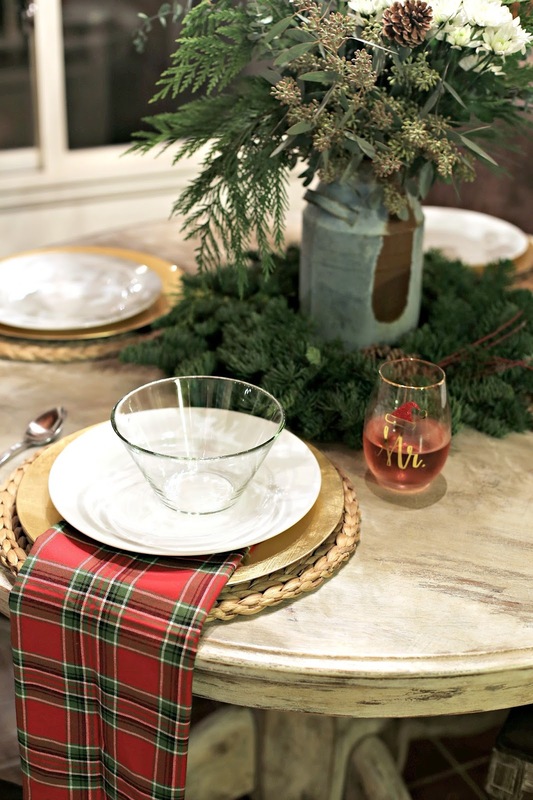 This Christmas, I chose to use white plates as a good neutral base. This set is Ree Drummond's Pioneer Woman collection at Walmart. I know what your thinking... Walmart? Yes, Walmart. Her entire line there is so beautiful and really nice quality. A lot of it reminds me of something you would find at Anthro, but for half the price. Totally worth it, and if you don't believe me, check it out for yourself! Almost everything else on my Hutch is from Target. I look forward to checking out their Christmas section every year. I love that they always stick with the trends, and once again, make it affordable for everyone. 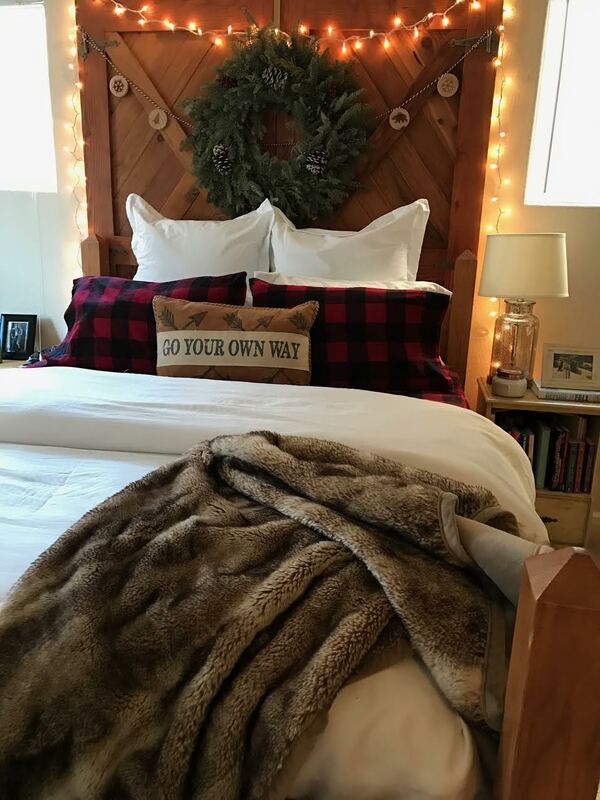 Winter time at our house is my absolute favorite because it allows me to dress up our barn door headboard. I love putting a fresh wreath on it, the smell makes me so nostalgic for Tahoe Christmas's (a tradition we had growing up b/c my mom's side of the family is all from there). My dad, Jason and I made the headboard together over a course of a few weekends, so they are so SPECIAL to us. Buffalo plaid was my go to this year for my new purchases. I snagged these sheets at Bed Bath & Beyond and couldn't be more excited. They are soft, affordable, and can really transform your bed in a matter of seconds. I also bit the bullet this year and invested in a nice duvet cover from Pottery Barn. I did my research b/c I wanted one that was extremely soft and it had to be white. I found this one on one of the display beds in PB and had it have it. 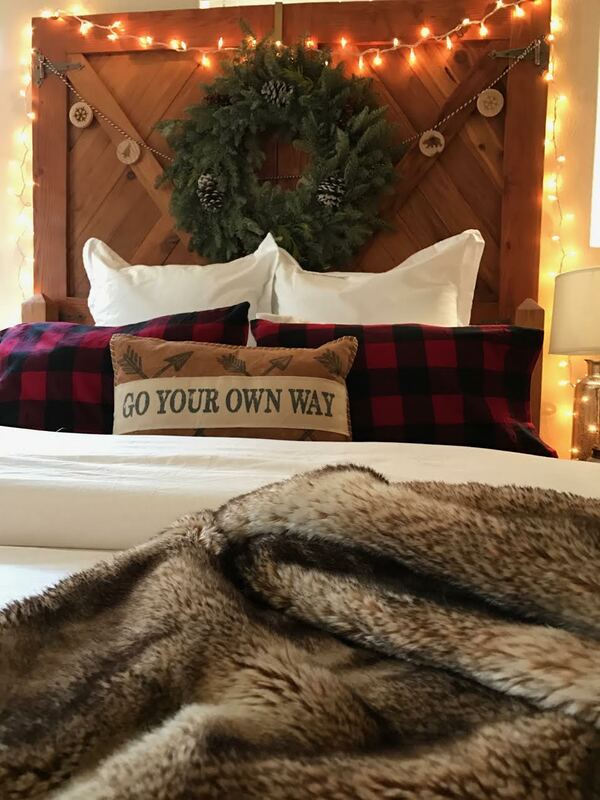 I learned on PB's website that they reccomend sticking with neutral colors for bedding, but then adding depth and dimension by incorporating different textures. This can be achieved by adding a second duvet (with ruffles), a patterned white quilt, or my go-to faux fur blanket (the best). Last but not least, invest in euro pillows and shams. Andrea actually taught me this! They really make a bed come together. If you have a queen size bed, buy two and if you have a king, buy three. Having said that, I adored my grandfather to pieces and so I wanted to incorporate a lot of his belongings in our house. 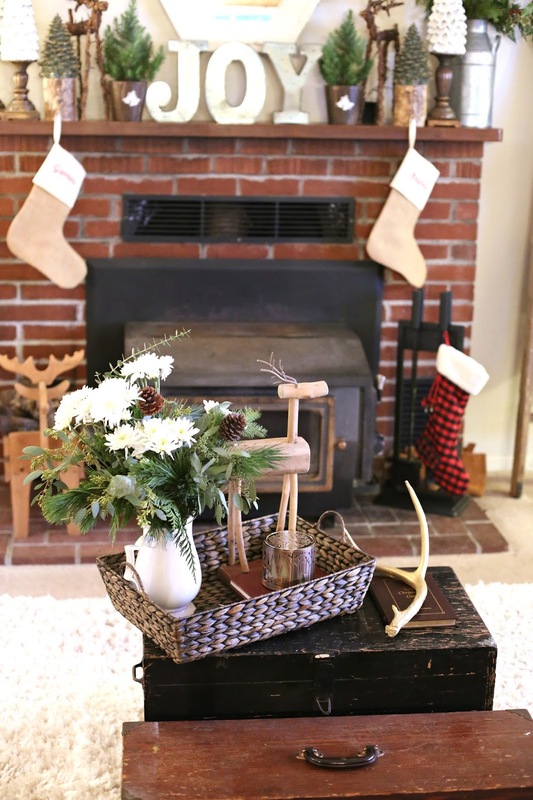 For example, he was an avid gun collector, so I found this old shot gun shell wooden box in his garage and now I use it as a centerpiece on our dining table. I also have a lot of his books out on display as well as his milk jugs, ice skates, and an antique lantern. These treasures that I found at grandpa's house really make our house feel like home. On another note, our house would not be complete without our TREE! This has become our favorite Christmas tradition that we have been doing for the last four years. We always cut our tree down the day after Thanksgiving. I am like a kid at heart and picking out a tree with hot apple cider in hand is the best way to kick off the holidays. Thank you for letting me share our home with you guys. I hope everyone enjoys time off with their loved ones. 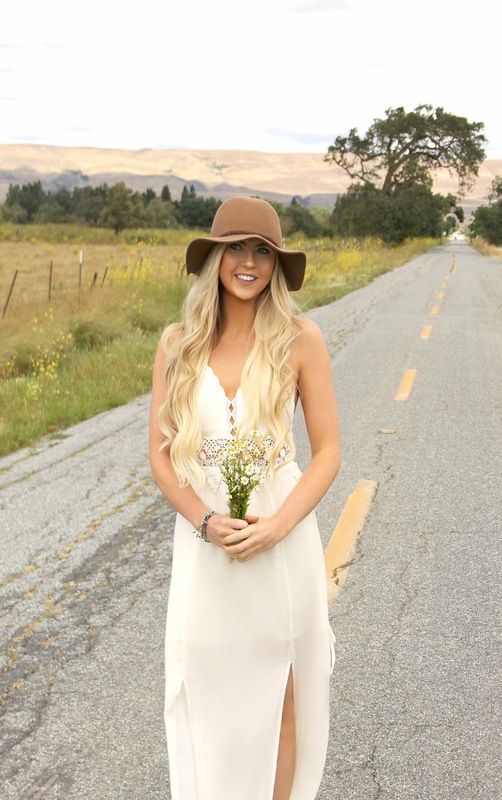 I'm happy to share that we are having a very special guest takeover the blog today, Miss Andrea McDonald. Andrea has a talent for combining antique items with new pieces to create the coziest home aesthetic. She has mastered the design equation that makes everyone feel welcome and at ease as soon as they walk in her front door. Her design style is timeless and has a unique rustic charm that is hard to not swoon over. Watch out HGTV, Andrea's attention to detail and eye for design may just make her the next Joanna Gaines! 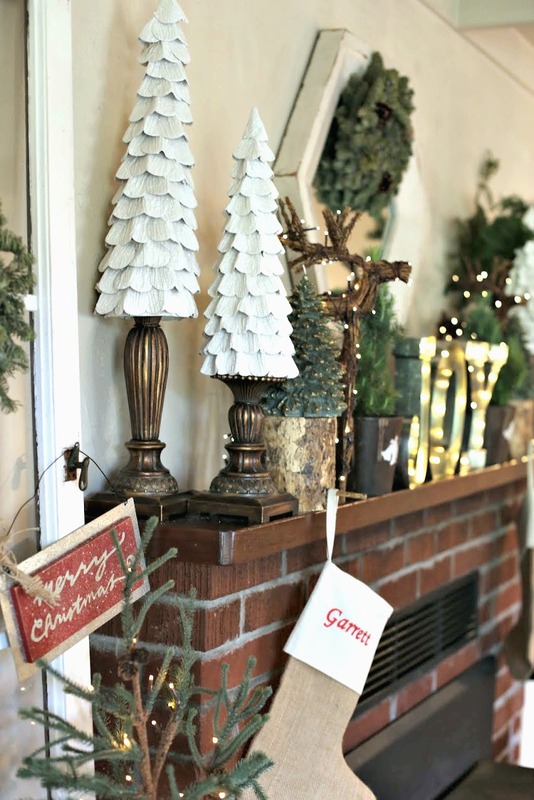 Today I wanted Andrea to walk you through her holiday home tour: Christmas in the Woods! Let's start out by learning a little about our guest! Enjoy! CAN YOU SHARE A LITTLE BIT ABOUT YOURSELF FOR OUR READERS TO GET TO KNOW YOU? 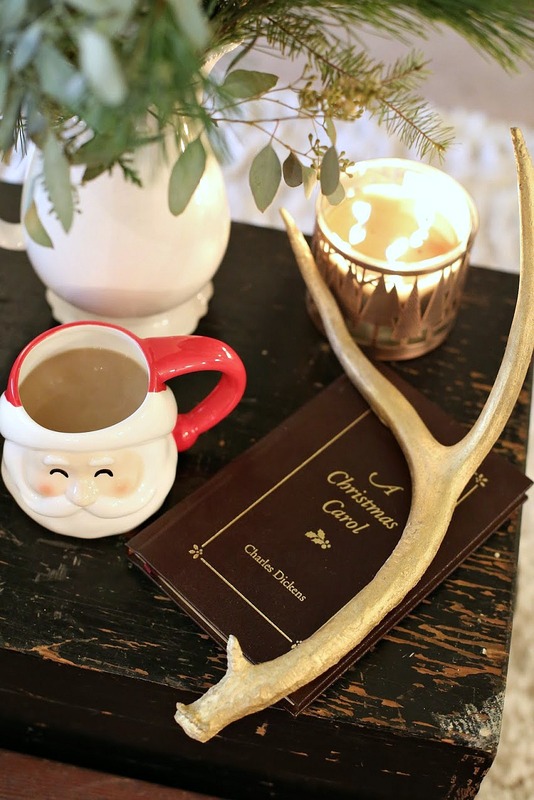 Honored to be a special guest and share my obsession with home decor and Christmas, thank you! 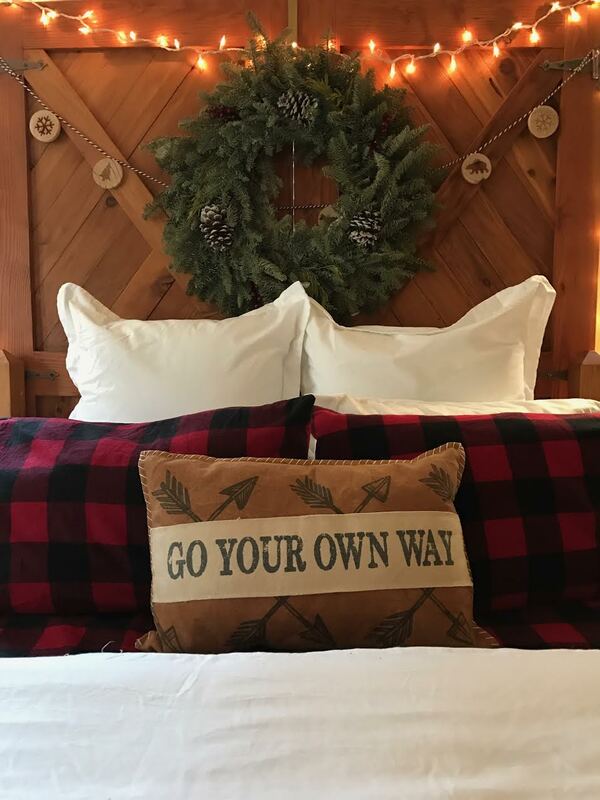 There you have it, in one sentence: I am obsessed with home decor and holidays! My whole life my heart, eyes and hands have been drawn towards creativity, art and design. It feels the "design and home decor bug" is in my blood, I can't run from it! Chip and Jo are my heroes - my soon-to-be husband says I need to stop watching the same episode over an over, ha. Home decor is my hobby. Home decor fulfills me in ways that nothing else can. Home decor is the way I express myself. When I am not restyling things in our home or hunting for the best deals at World Market or Pottery Barn, you can find me drinking coffee in the morning, wine in the evening, enjoying a good spin class, hanging with my amazing family or snuggling my fiance` and (or) puppy! 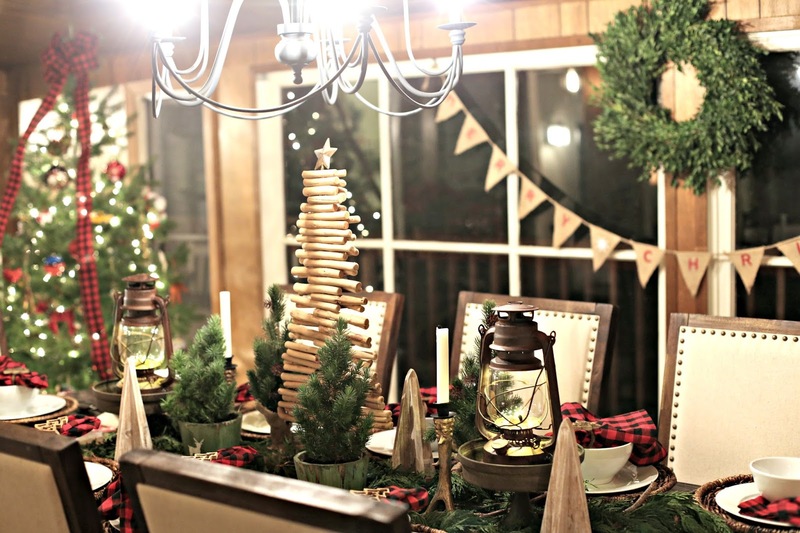 CAN YOU SHARE SOME TIPS FOR DECORATING YOUR HOME DURING THE HOLIDAYS? 1. Layer, layer, layer. Layering a room is paramount to comfort and visual warmth. 2. Keep things neutral and add live greenery all over your home. Don't minimize the power of green. For years growing up I associated Christmas with red, golds, silvers, glitter, etc. What about good ole' pine green? Try it! Next time, skip the reds and glitter, keep it more basic and natural! During Christmas, my favorite room is our living room/entry way. In our little cabin in the woods, our main source of heat is our wood burning stove, so we often find ourselves cozied up in front of the fire (usually with a good glass of wine in hand) and enjoying our mantle where the "stockings are hung by the chimney with care..." :) A very close second (and some days my favorite) is our dining room. One of the best parts of the holiday season is gathering around a table with your loved ones - I take my tablescape/place settings seriously (as you can tell from many of these photos). FINISH THE SENTENCE “EVERY ROOM IN A HOUSE NEEDS ______”. Fresh flowers or simple live greenery! As I said above, don't every minimize the power of green. If I could answer the question twice, I would say... old books! There is so much you can do with old books. All of the books in our home are my fiance's beloved grandfather's. 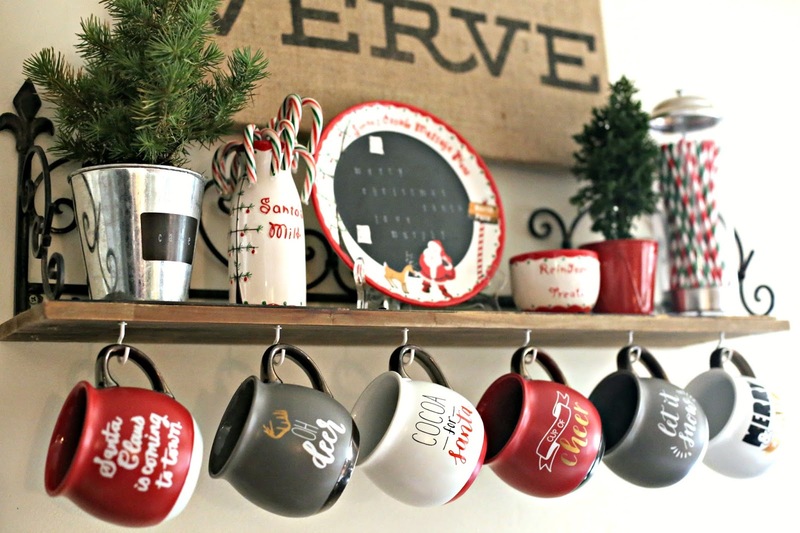 They have extra special meaning and make for great additions to our home decor! Everyone's home is a reflection of who they are, whether they like it or not! 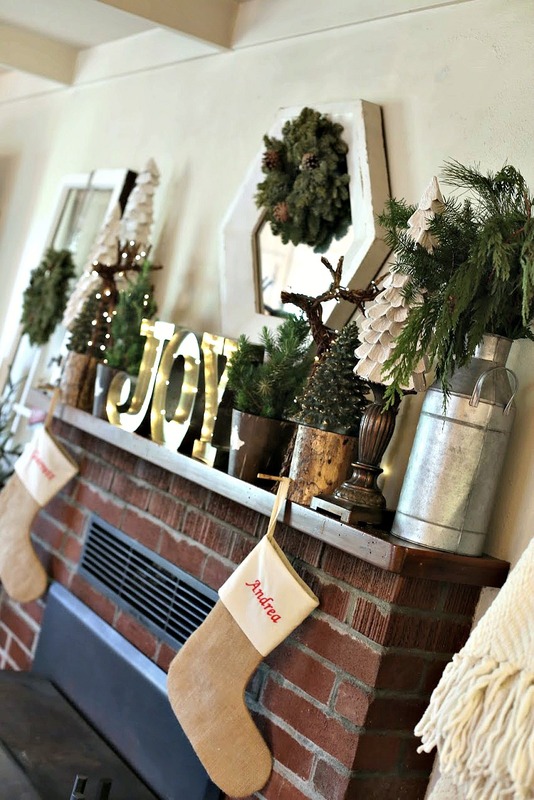 :) Our home and our holiday decor is truly a reflection of who "we" are. My fiance` loves to hold onto special antiques from his family members. 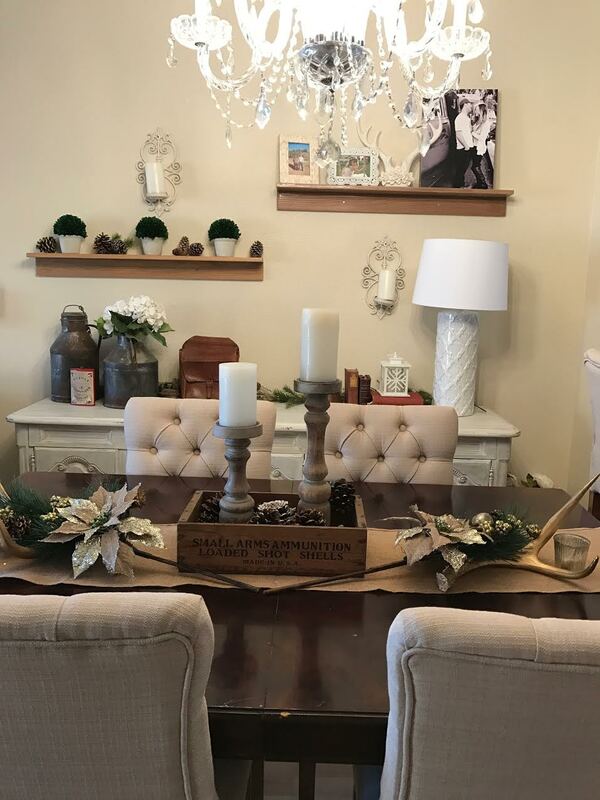 Luckily, I have been able take those special pieces and compliment them with new farmhouse pieces - old world meets new world meets country farmhouse. Push yourself to think outside the box. As I said above, instead of getting rid of old books, or an old wheel barrow - ask yourself if you could use it in a creative way!? 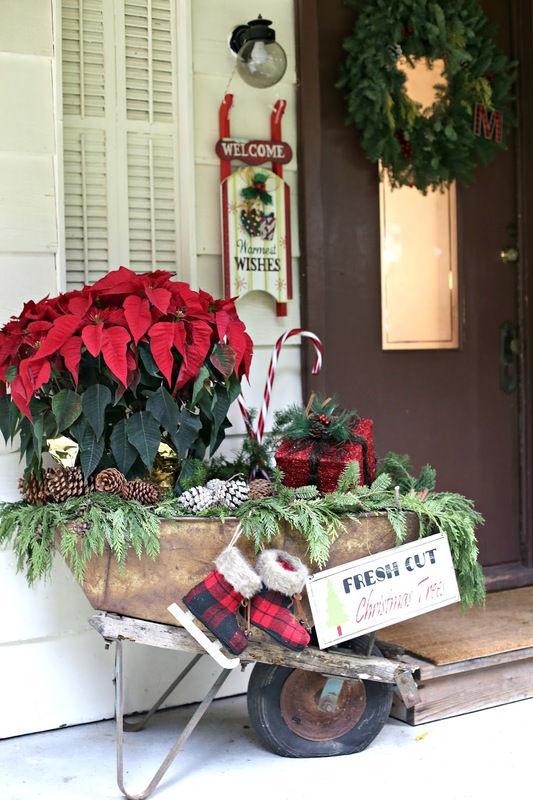 Could your wheel barrow be a sleigh?! In that same breath, my philosophy (which sometimes I get in trouble for) is: one in, one out! If I buy something, I try and get rid of something. Not only am I obsessed with home decor, I am addicted to organization and a clean home 24/7! The word "clutter" and "andrea" don't belong in the same sentence. Remember, as I said above..it isn't always about the latest and greatest thing to purchase and spend all of your disposable income on! Our coffee table styling is a perfect example of just that. I mentioned above "our little cabin in the woods" - we get a lot of wild animals where we live. Every year, a part of a deer's natural cycle of life is to shed their antlers. I found this antler laying on my driveway a few years back. At first, I wasn't sure what I wanted to do with it. Last Christmas I decided to spray paint it gold! The best part of all, it was free and it is special because in years to come when we no longer live in this home, we will always remember all of the beautiful deer we would see all over our property! Remember how I mentioned above that my fiance` (Garrett) loves to hold onto old family furniture?! Our coffee table is actually two old chests: one from his dad that was at the foot of Garret's parents bed as he was growing up and the second is Garrett's grandfathers old chest that he hand built! I promise I will shut up about old books....but how cool that we have this old antique version of the "Christmas Carol" - every time I look at it I think about how special our Christmas holidays were growing up at my Nana and Papa's house in Boston. See the old books? I wasn't kidding! You can use them everywhere in your house! My parents were throwing away these old cook books...oh no you don't! They make for great laying in our kitchen. Same goes for cutting boards - don't put them in a cabinet! Style them on your kitchen counter. Same goes for old medicine bottles or milk bottles! 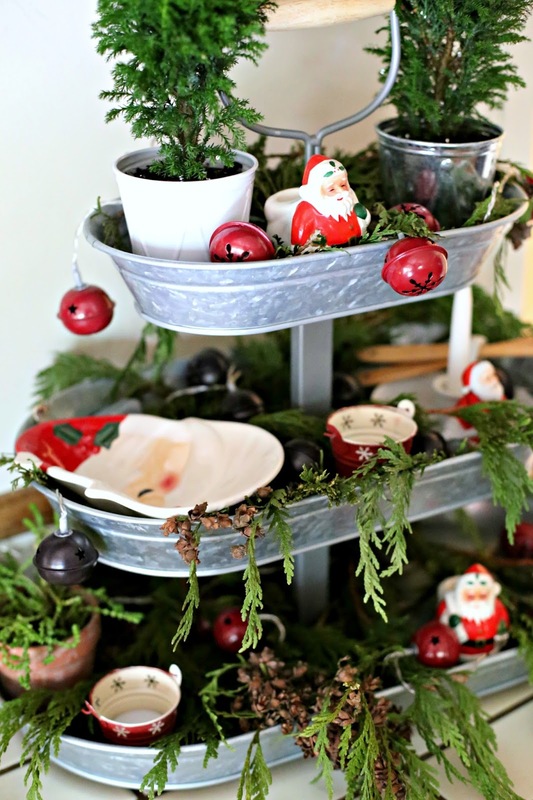 Add some fresh herb sprigs (or for Christmas use pine tree sprigs)! The opportunities are endless. The key to it all: think outside the box. Old does't mean hurry and rush that crap to Goodwill...pause and think creatively. 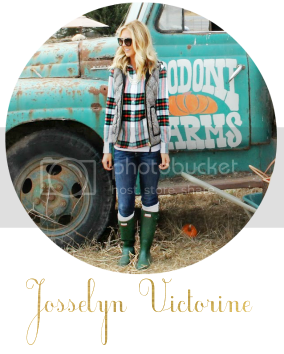 Especially if your style is farmhouse like me! 1. Chargers are critical. They add more to a table they you realize. They don't have to be expensive or anything crazy, but don't skip using them if you have the space. 2. Layer, layer, layer. My layering tip comes up again :) Use dinner plates, salad plates, bowls, napkins....etc. You get the idea! 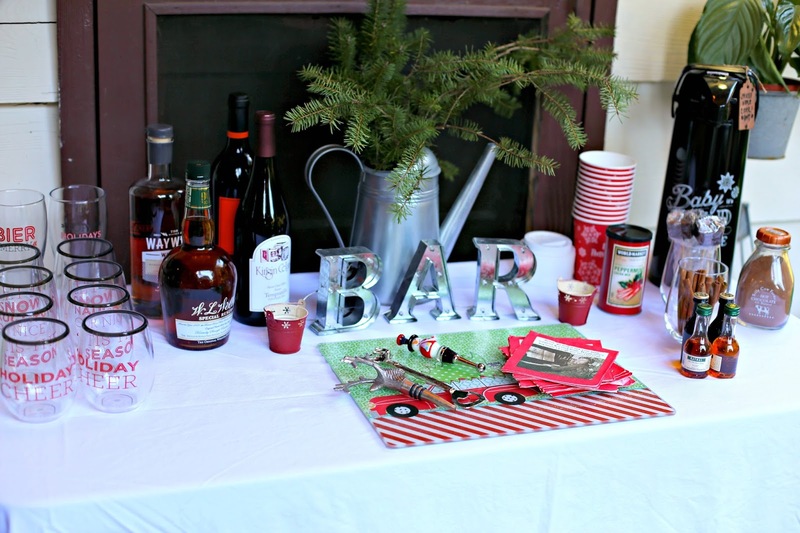 Keep adding, yet don't clutter your table too much! Try and keep it somewhat functional. 3. My FAVORITE part of any place setting - NAPKINS and NAPKIN RINGS! We have all white dishes and serving plates. But..hiding away is my stash of all different colors and patterns of napkins and napkin rings to match every occasion. 4. That brings me to another tip: I am a big fan of white dishes/china. 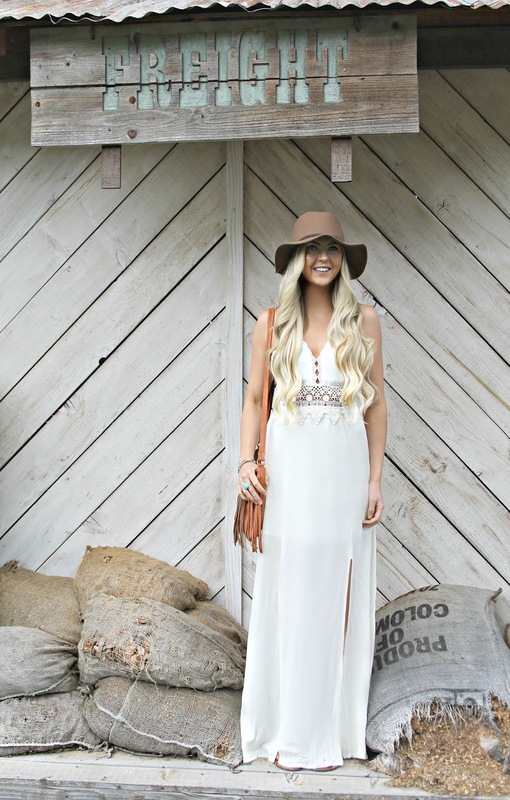 It is timeless and you can always dress it up or down. White also keeps tables fresh and looking clean. Too many colors can be overwhelming to the eye. 5. Pick a theme and run with it! 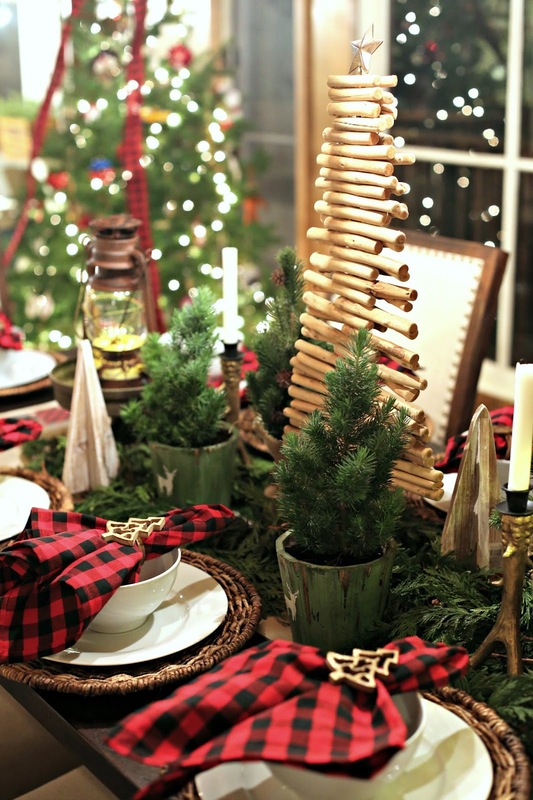 For this Christmas season I went with a Christmas Tree/Antler/Buffalo Plaid theme...Christmas in the woods! 6. Always make fresh and live flowers or greenery an aspect of your center piece. It breathes life into your table and meal. 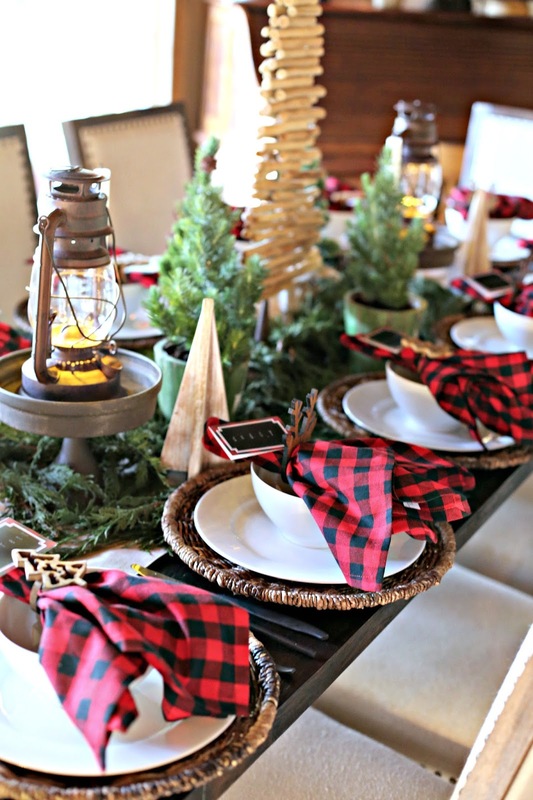 Keeping consistent with my Christmas in the Woods theme of our dining table (and our whole house), I got this awesome Buffalo Plaid ribbon from Amazon and taught myself how to make my own over-sized bow! The key to a successful bow - thick wired ribbon! I taught myself by watching this YouTube video I found on Pinterest...it is simple! Watch and try it for yourself. Despite being brought up with traditional Angels atop our Christmas Trees, I thought this bow would be fun for this year! If you take away nothing else....have fun decorating! Whatever it takes to make it fun for you, do it! In this house, we make spiked cider and open a special bottle of wine when we decorate our Christmas Tree! 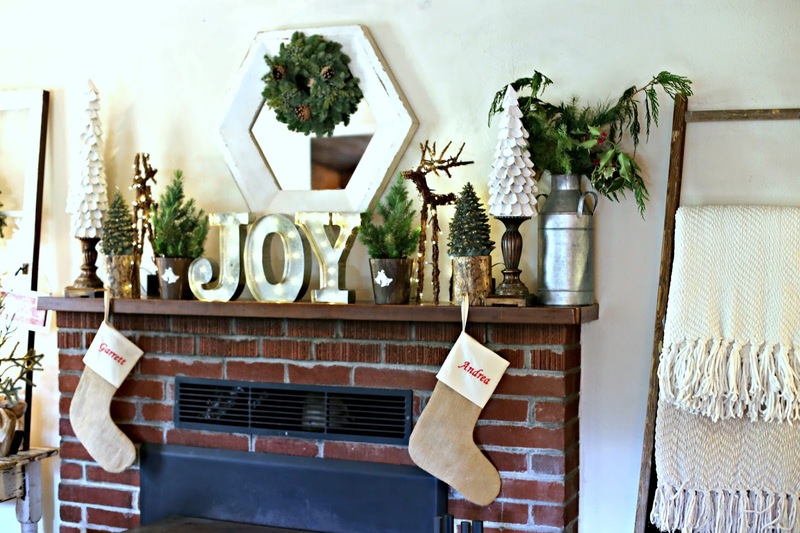 Thank you for sharing in my joy for this special season and my obsession with home decor! I have made home decor my hobby because it makes me happy! What makes you happiest?! Go and do it. Make it your new years resolution to turn what makes you happiest into your hobby. 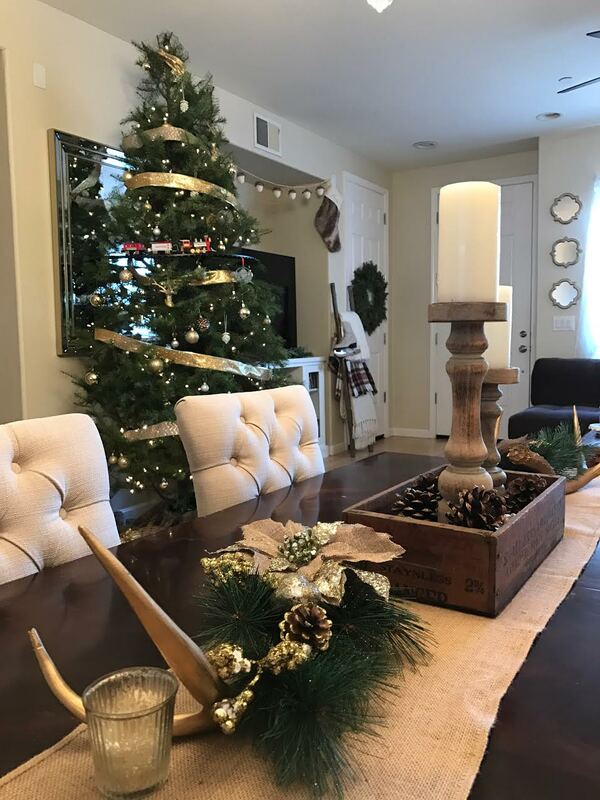 For any questions or to see more photos of our homes throughout the year, follow me on Insta! And to my beautiful friend, Joss! Thank you for the special guest feature! Merry Christmas to all from our home to yours. Thanks everyone for stopping by today. 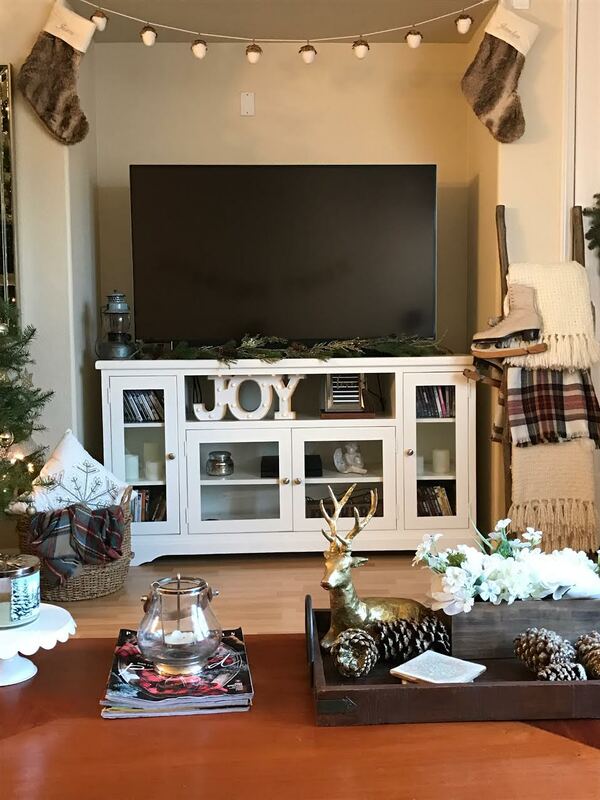 Don't forget to share this post and to follow Andrea for more home styling tips and inspo @angmcd. With the 4th of july holiday fast approaching, I couldn't think of a more fitting outfit for this upcoming 3 (or 4)-day weekend. Everyone loves a pair of classic Levi's! I have been wanting these shorts for so long and I finally found a pair that fits just right. 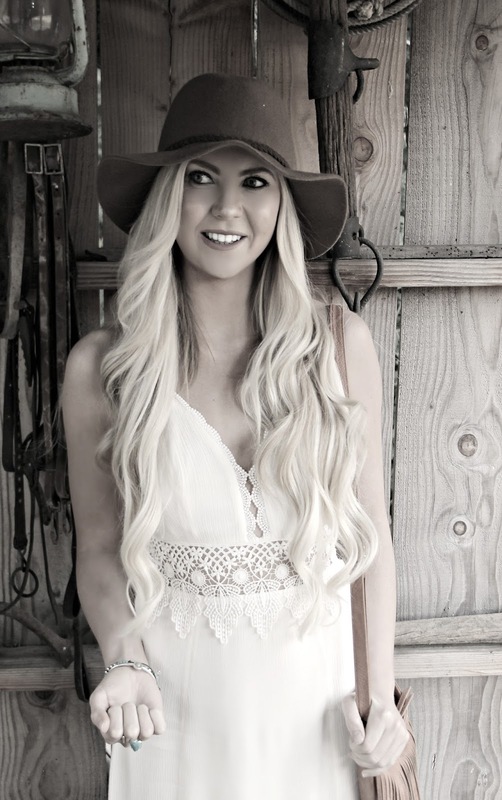 It can be hard to find flattering high-waisted shorts, but these ones are THE BEST! They are perfect for a day out on the water in the summer heat. Does anyone have any fun plans? We haven't solidified ours yet, but I'm hoping to be somewhere on a lake soaking in the summer sun. I am so excited to share this outfit with all of you because it is a BARGAIN. I recently discovered the store, Tilly's. I know, I think I am behind on this one. But, WOW, seriously this place is filled with every summer essential you will ever need. 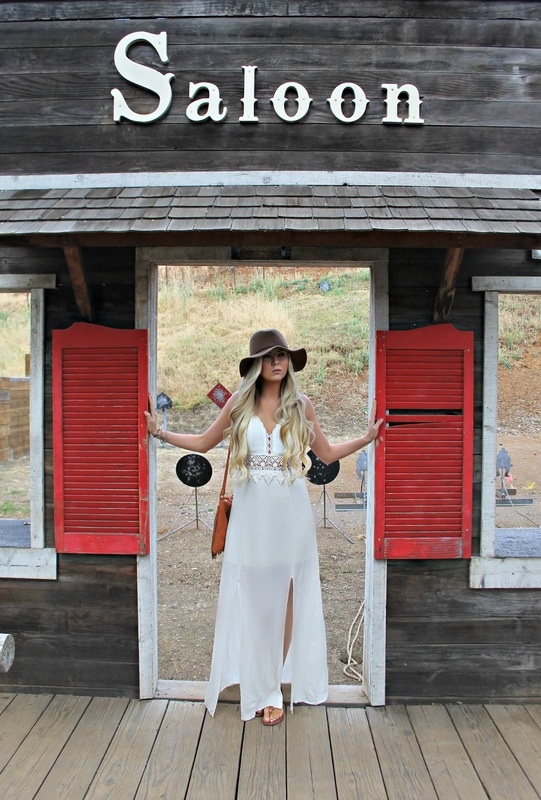 From swim suits, to dresses, kimonos, and crop tops... this is a beach bums paradise. I am stocking up my warm weather wardrobe inventory for our upcoming trip to Kauai and I kid you not, I think I could get everything at Tilly's. So before I ramble on any more, to sum it up, my top is on sale for $14, which is super annoying because I bought it at full price. Pants are only $25 and they can double as pajamas, seriously sooooo comfy. I bought my flats at target and they are a dupe of the Sam Edelman Gigi sandals. They are great knock-offs and are on sale for $18 (I also bought these at full price recently so wahhh). On another note, these pics were taken at the Santa Cruz Beach Boardwalk. If you are in the area, this is an essential summer activity. We spent the day jumping on different rides, soaking up the sun, and eating mass amounts of fair type food, YUM (aka churros and dip n dots).